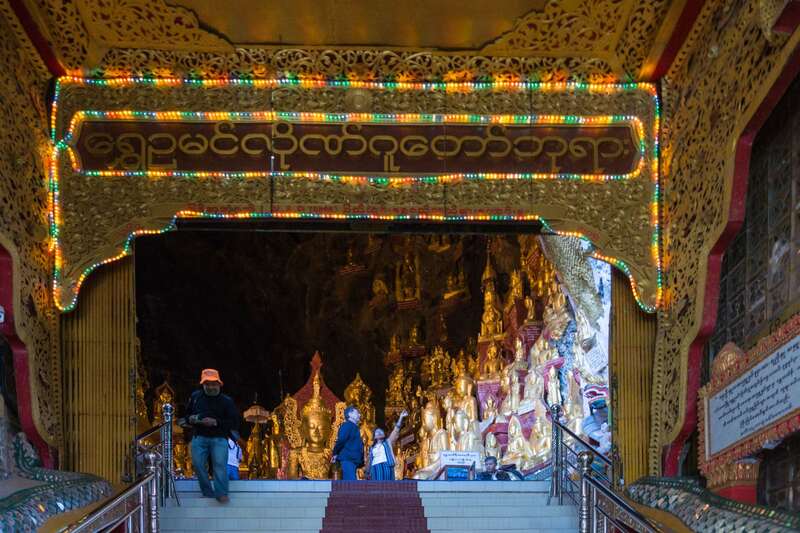 Pindaya’s Shwe Oo Min – The Shan Cave of The Ten Thousand Buddhas! 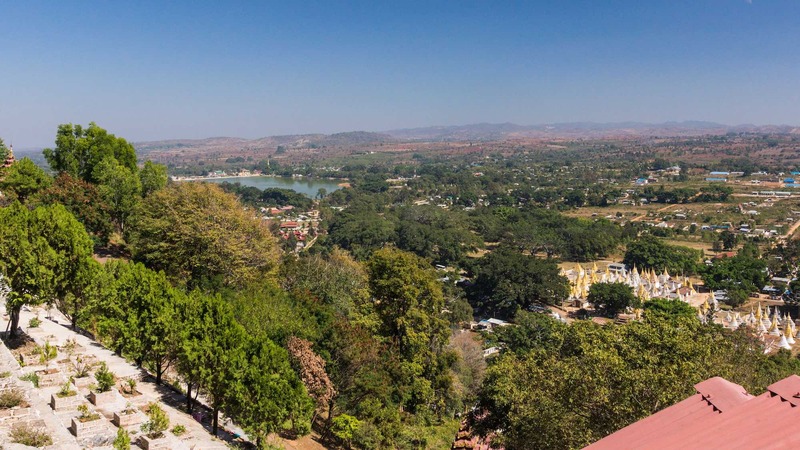 Having spent a couple of days in Kalaw, we were on the move again. The town of Nyaung Shwe at the top of Inle Lake was our destination. However, before we headed there we went up to Pindaya, famous for the caves found in the limestone ridge south of the town. 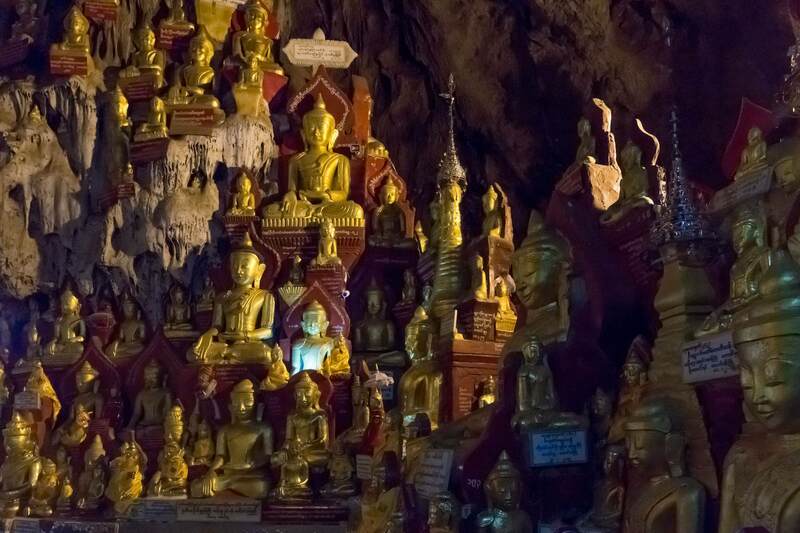 The attraction is the Shwe Oo Min Pagoda which fronts an extensive maze of caves and connecting passageways in which Buddhists have placed Buddha statues over the centuries. (The oldest date back about 275 years.) While there are not quite 10,000 statues (8091 according to one recent count, 9000 according to another), it is just a question of time before the Buddha-meter passes that number! 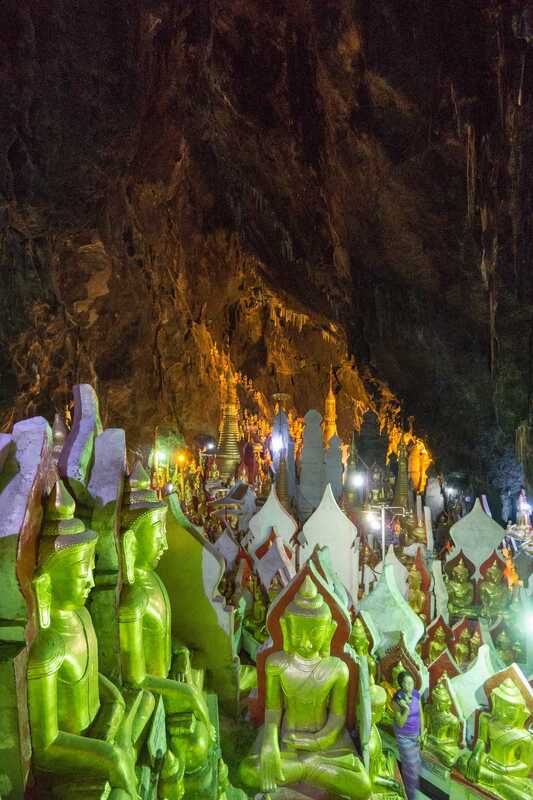 Some fifteen years ago while in northern Laos, Laila and I had taken a boat some 25 kilometres up the Mekong River from Luang Prabang to see the Buddha statues in the Pak Ou Caves just above the west side banks of the river. 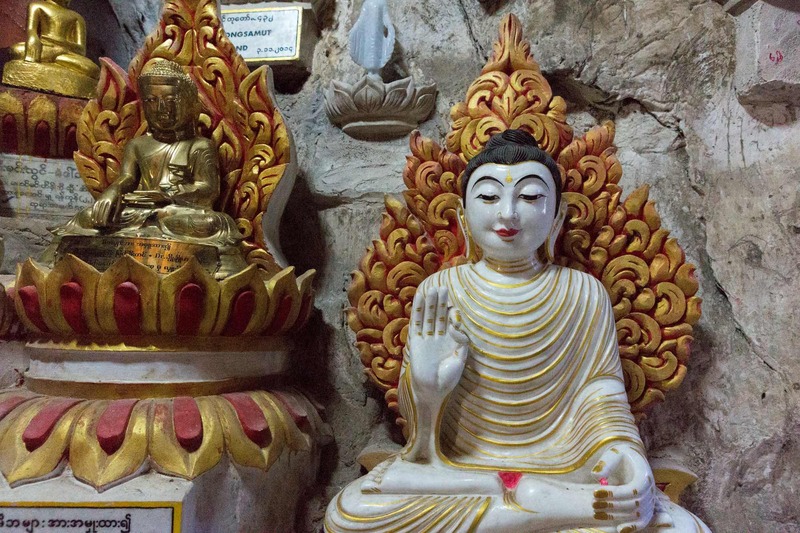 The Buddhists of Myanmar and Laos both belong to the Theravada branch of the religion. 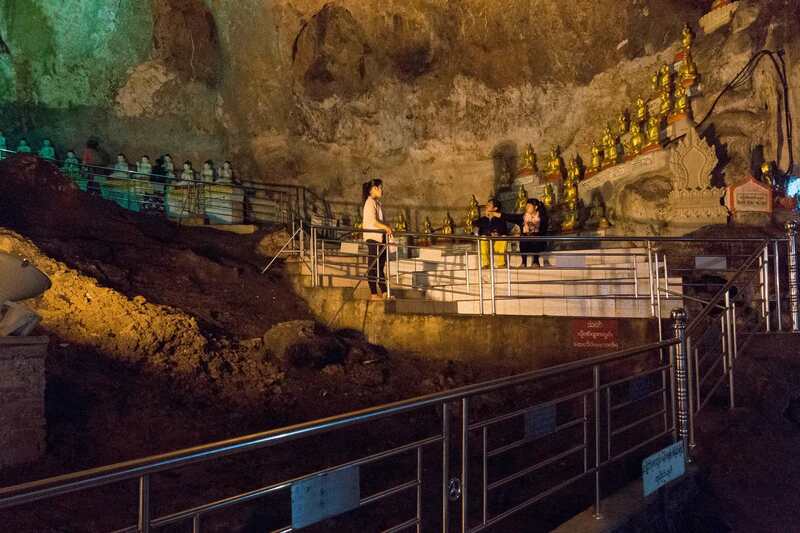 As memorable as that visit had been, the Pindaya Cave complex would prove to contain an even more impressive collection of Buddha statues, probably reflecting the greater agricultural wealth generated in the Pindaya area. 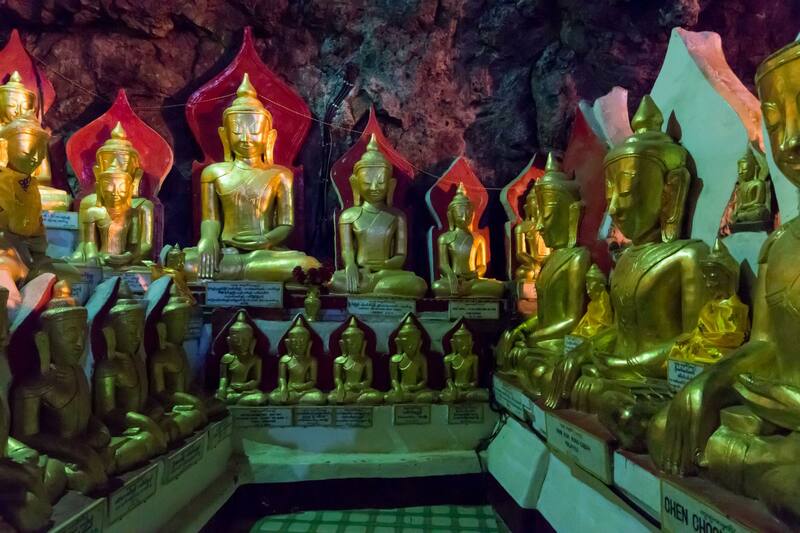 As you approach the pagoda and the entrance to the cave itself you see the dramatic statues pictured above. 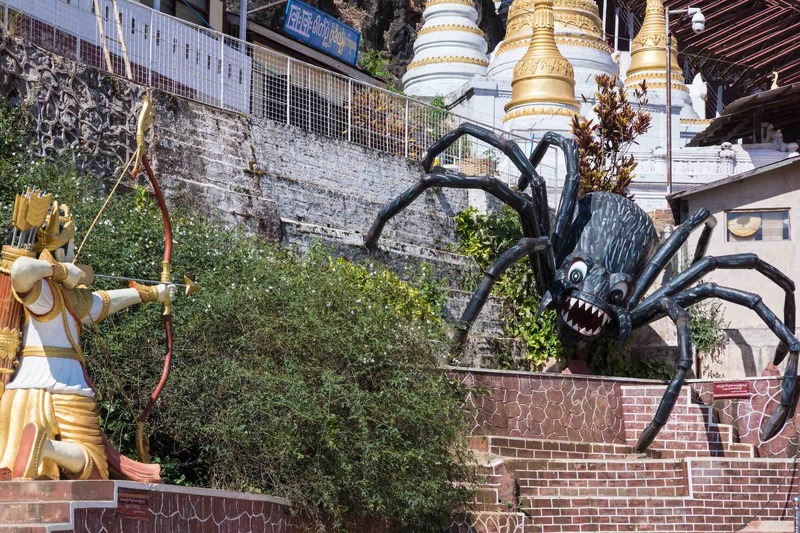 The Prince and the Spider statues recall the legend involving the caves, the giant spider, seven princesses held captive in the caves by that spider, and finally the noble prince Kummabhaya who kills the spider with an arrow from his bow and frees the princesses. 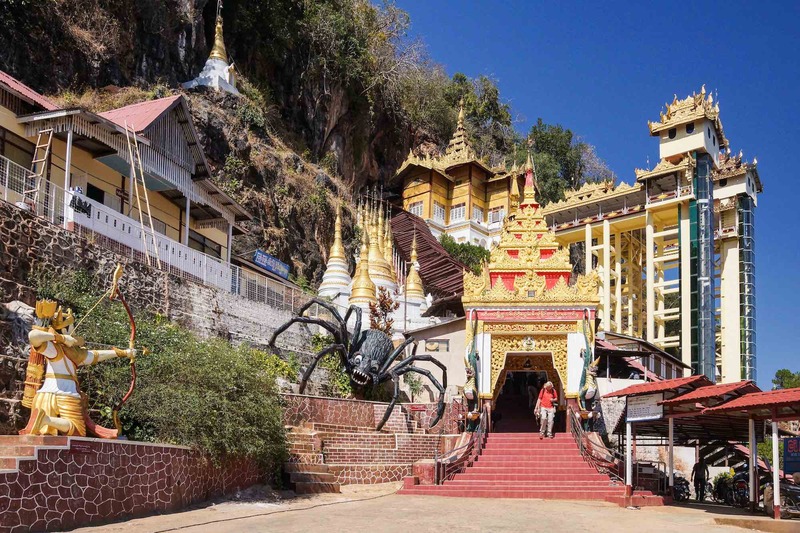 Supposedly the name Pindaya is a condensation of “I shot the spider” in the local language! 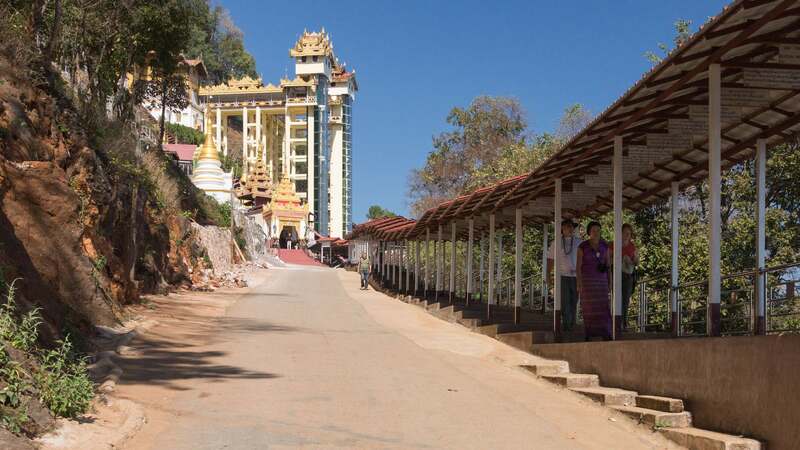 The cave lies behind the Shwe Oo Min Pagoda itself. 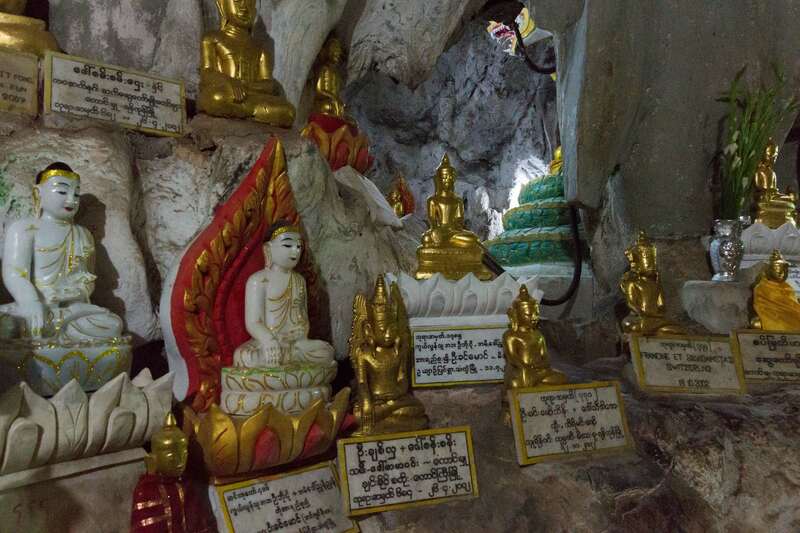 The stupa at the front of the cave dates back about nine hundred years ago. 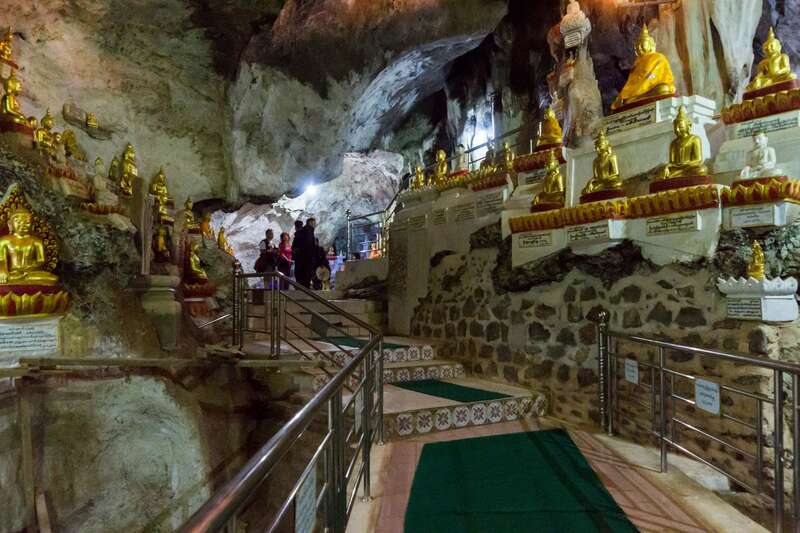 Inside the cave are the innumerable Buddha figures which attract both pilgrims with prayers, wishes, and offerings and tourists with their cameras and their curiosity. Getting decent photographs inside the cave proved to be a challenge thanks to the variable light sources – a mix of tungsten and fluorescent – and sometimes just not enough light at all! Some people will insist on walking around with the flashes of their cameras firing off, annoying other people while still producing mediocre images. The Buddhas I saw were overwhelmingly seated Buddhas in the “Touching The Earth” (aka “The Earth Is My Witness”) mudra. 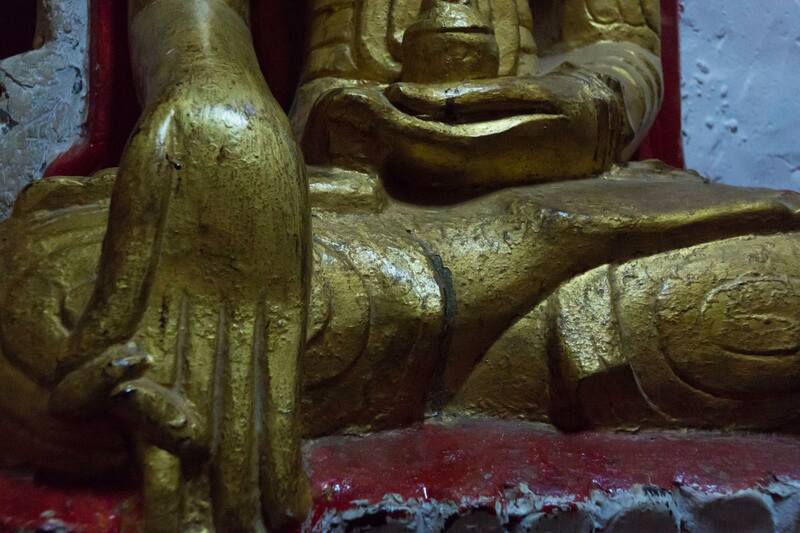 This position has the Buddha’s right arm resting on his right leg with the fingers touching the ground he is sitting on. The palm of his hand is turned to the inside. Meanwhile, his left hand rests on his lap, palm up and open. It recalls the moment when Siddhartha Gautama, sitting under the Bodhi Tree at Bodh Gaya, resisted Mara’s last futile enticement. 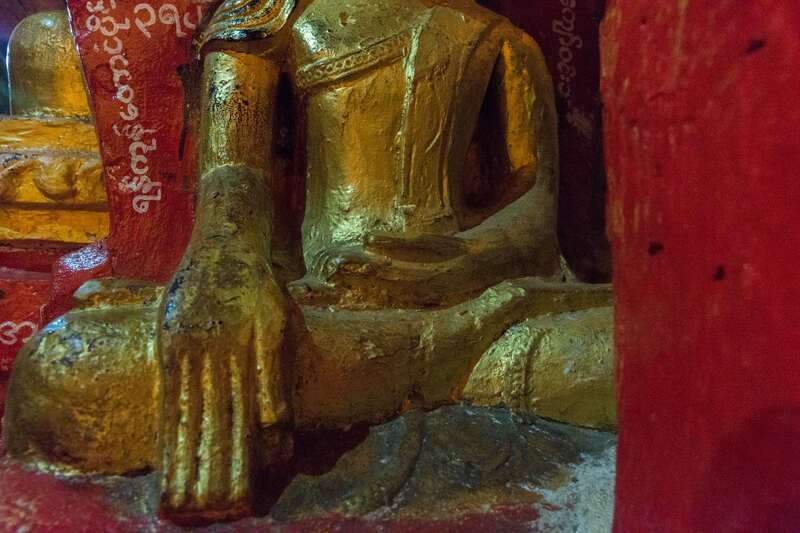 This mudra is the one that 99% of Myanmar Buddha statues are in! 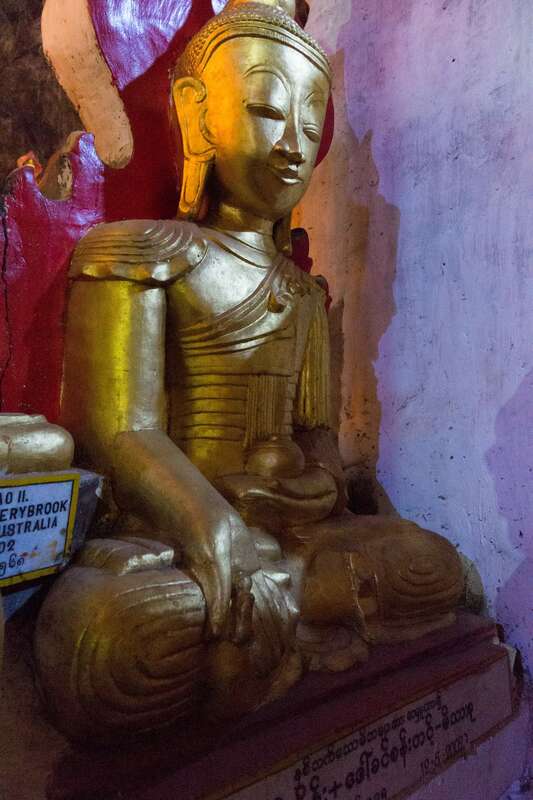 Attached to many of the Buddha figures are plaques with the names of the donors on them. 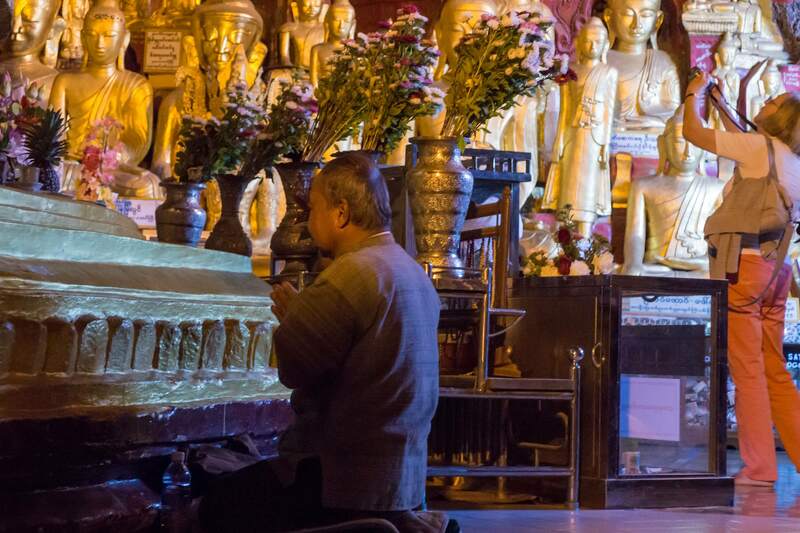 Devout Buddhists have brought the statues here – or have paid someone to do so on their behalf – to gain merit. 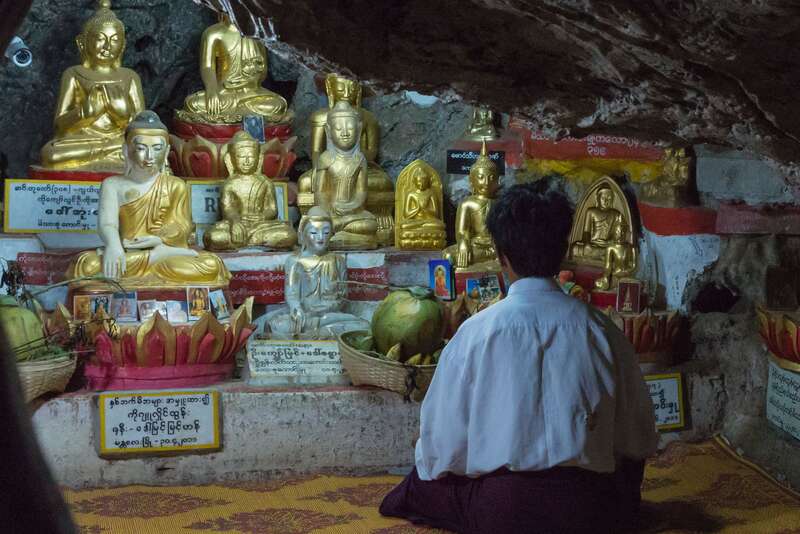 For a Buddhist lay person, the gaining of merit – whether by offering food to members of the Sangha or by contributing to the building of a paya (stupa) as in Bagan, or placing a statue in the cave here in Pindaya – is a fundamental practice. 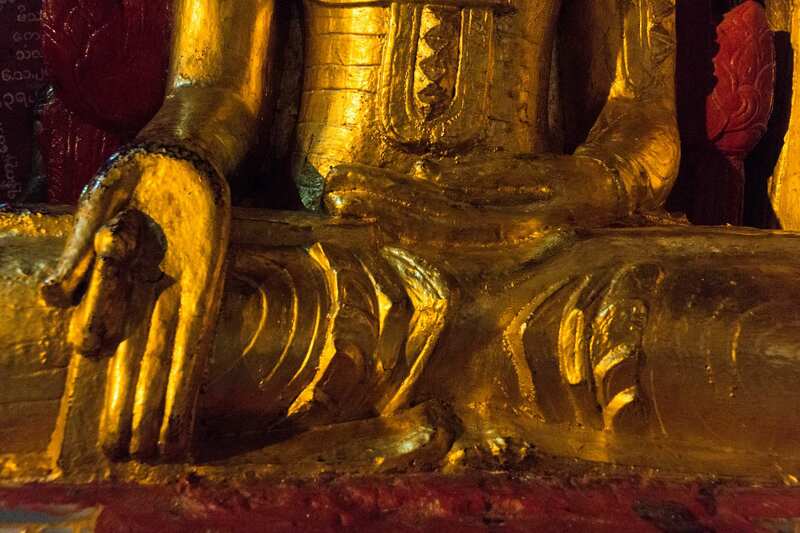 Theravada Buddhists ultimately aim to be released from the cycle of suffering, samsara, and to achieve nirvana. To achieve success in this world—and to advance to enlightenment in subsequent rebirths—they must build positive karma, or merit. 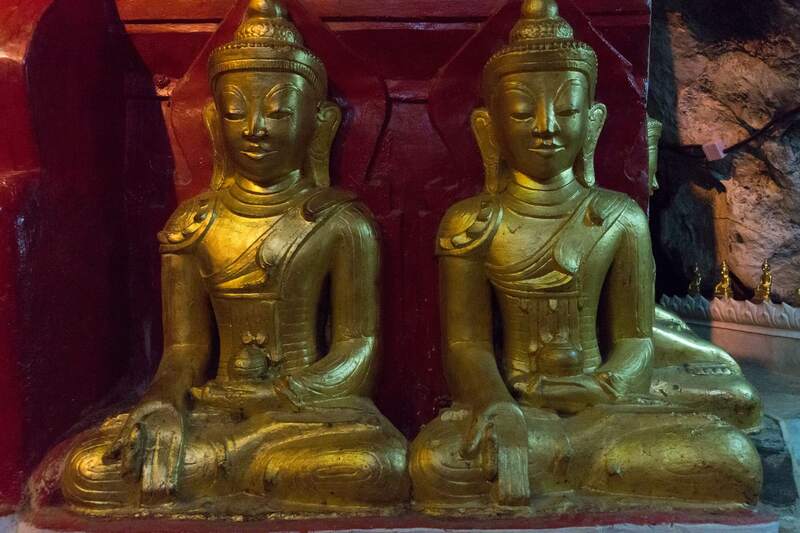 As in Bagan, the Buddha figures here, while exhibiting the required characteristics of a Buddha – the elongated ears, the stylized bump (ushnisha) on top of the head, etc. – are often not skillfully done. In the end, they are here, not because of their artistic merit, but because they bring merit to those who paid for them or installed them here. 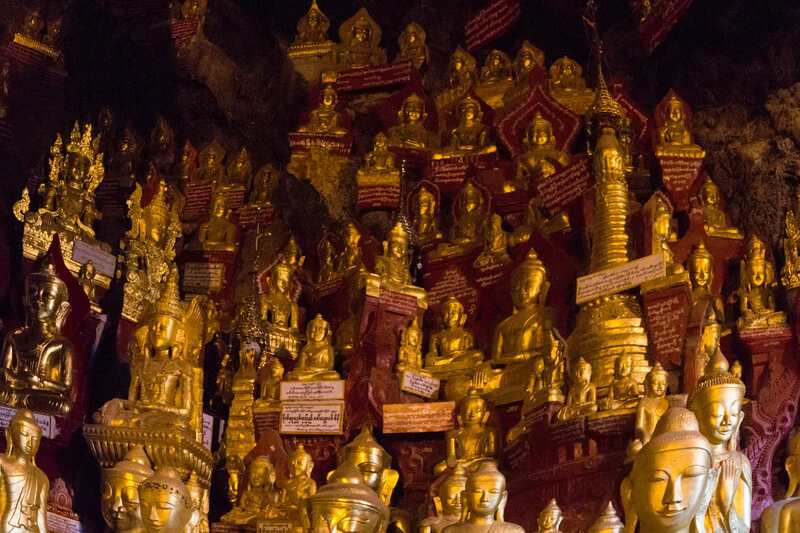 I reminded myself that this is not primarily an art gallery or a museum – it is first and foremost a living place of pilgrimage for Buddhist believers. Crawling through a narrow tunnel I came to this small grotto and a believer deep in meditation. 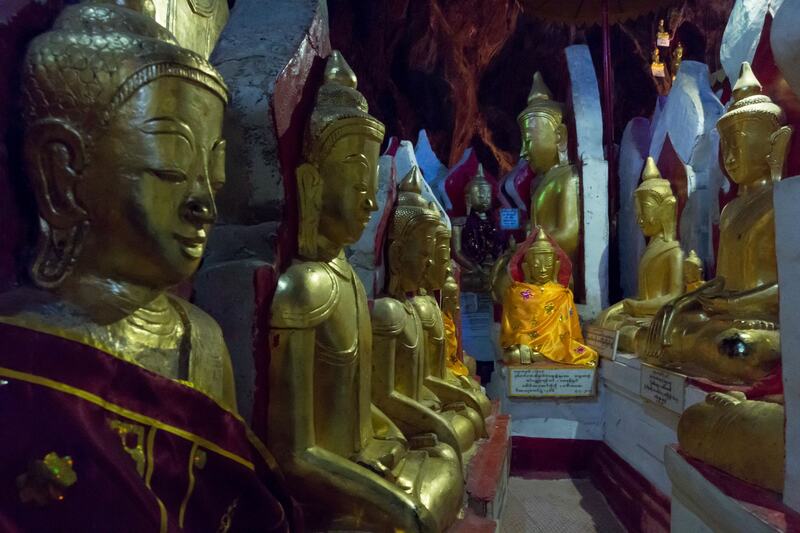 In front of him were a dozen different seated Buddha statues, most in the Touching The Earth mudra. I was puzzled when I came upon the following Buddha statue. His right palm faces outward and his index finger is curled up and seems to be holding something. 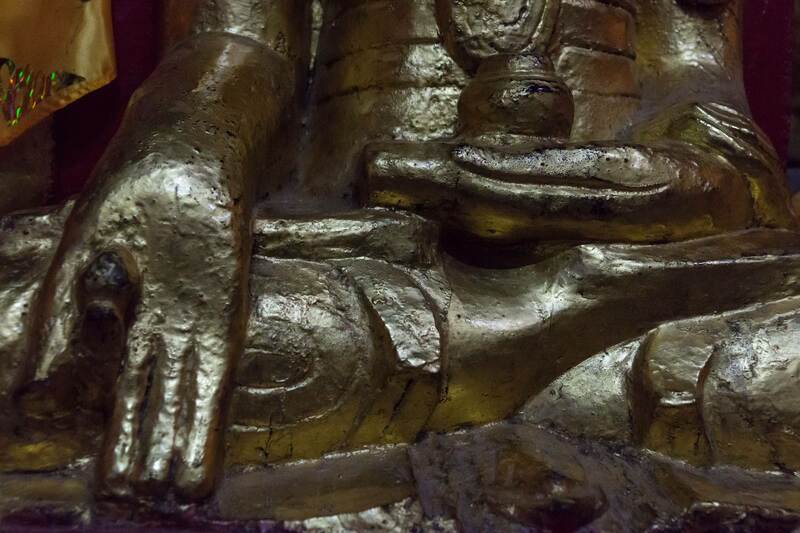 I had not noticed this particular mudra in any of the other statues. seated Buddha with medicine bowl and the dharma seed? And now there were a number of the unusual mudras all in close proximity. Below are a couple of other examples of the unusual hand gesture. When I returned home further research turned up an explanation. See below for the quote that made sense of it all! Within the cave, there are about seventy unique images of the Bhisakkaguru tradition dating to the late 18th century. They are unique in that the styling of hair, eyes, nose, ears, robe are different from most other images from Burma. The salient feature of this type of image is the holding of a seed in the upturned right palm. 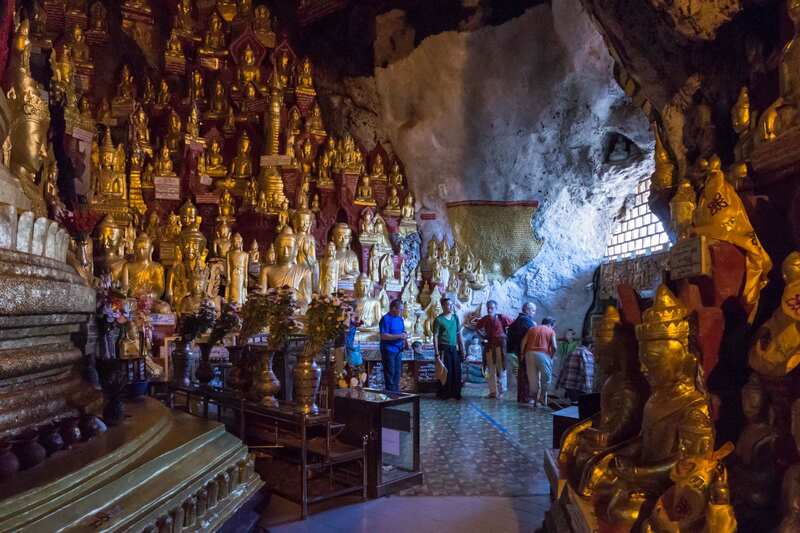 Than Tun reports that such images are found nowhere else in Burma, and based on Buddhist iconography, that these images are from the Mahayana tradition, and the conjecture is that the Pindaya cave at one time served the Mahayana Bhisakkaguru cult. 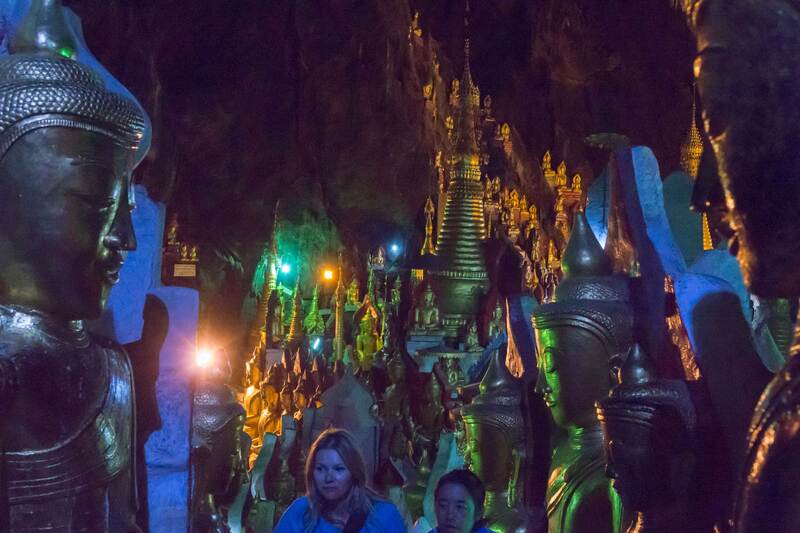 And then it was back to the usual Touching The Earth mudra of most of the cave’s statues. Time was running out and I headed for the exit to rejoin the others when I came upon a passageway that led to a whole new section of the cave complex that I hadn’t even realized was there! 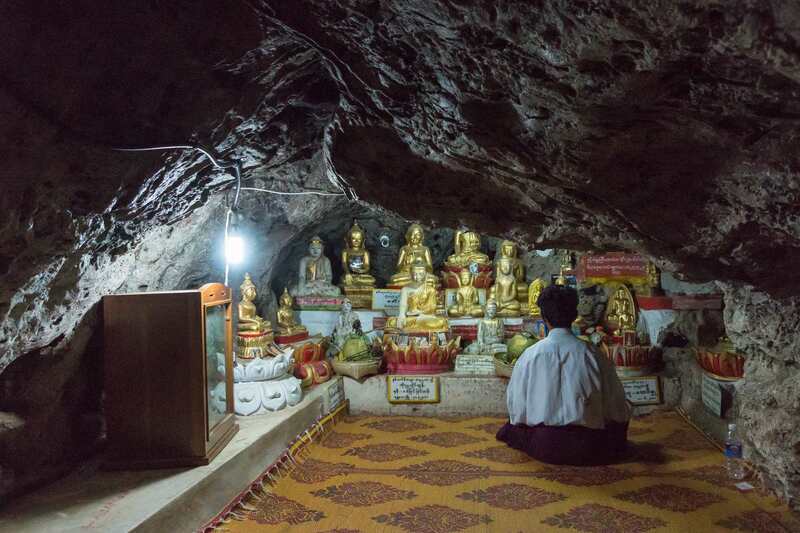 The images below show a much less crowded and claustrophobic section of the cave; another 100 years and future generations of merit-seeking Buddhists will fill up the empty space. 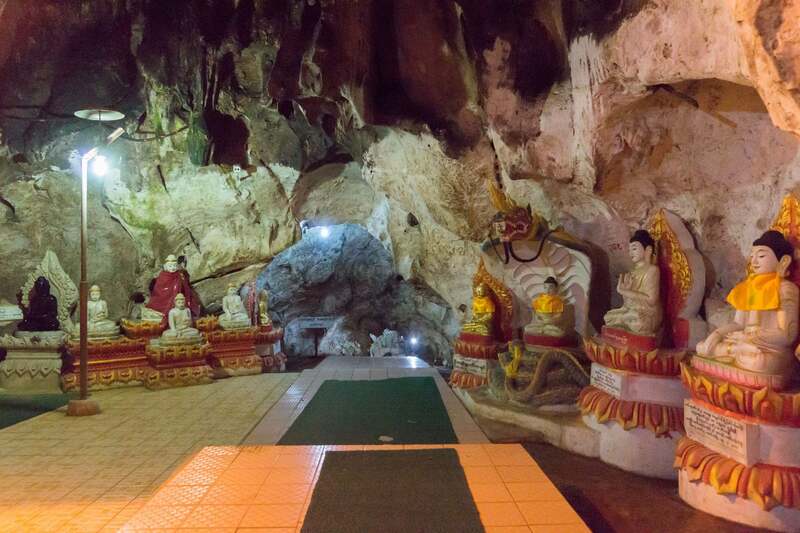 The Wikipedia entry “Pindaya Caves” is an excellent overview the topic. 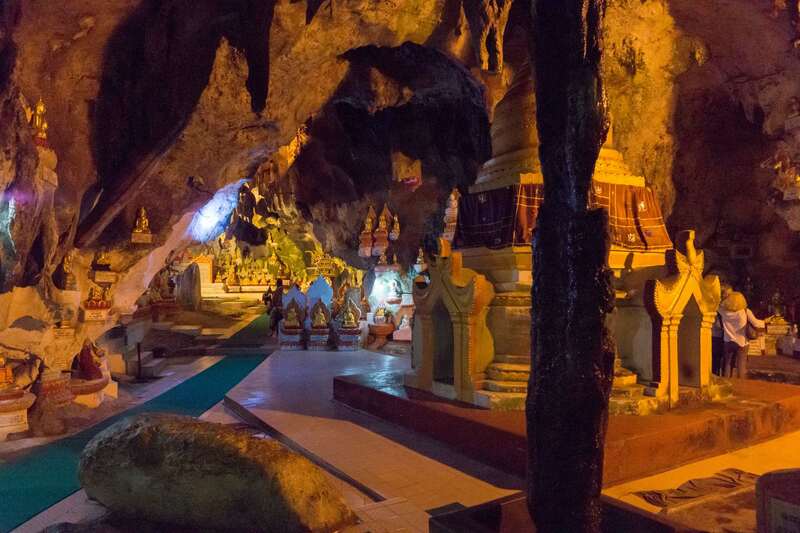 The Lonely Planet website has some basic info on the caves and how to get there. 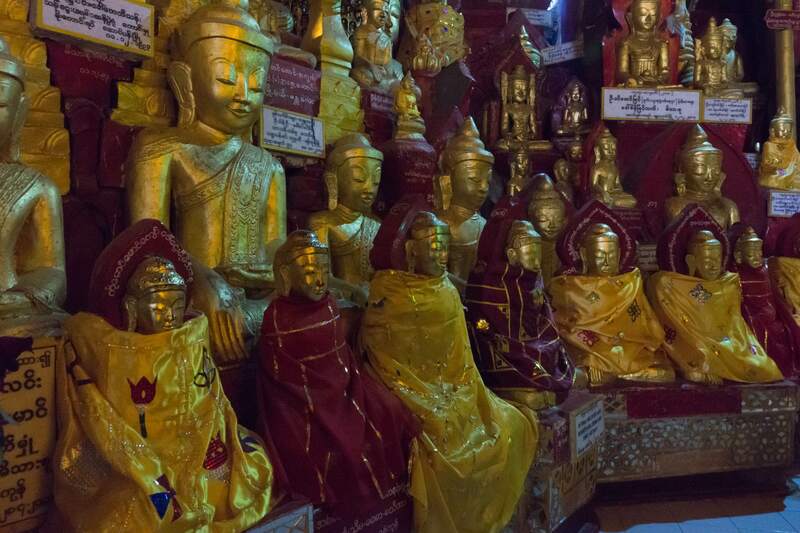 A brief article titled “Buddhism In Myanmar” in Harvard Divinity School’s Religious Literacy Project provides an explanation of the significance of merit making in Myanmar Buddhism.